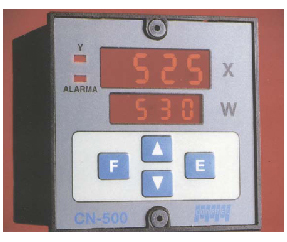 Temperature regulator set-up by keyboard, applicable in processes which require actions on contactors. PID control with self-tuning or ON-OFF with adjustable hysteresis. Permanent display of the variable and its setpoint. Display using status LEDs for the control output and the alarm. Absolute, relative or band configurable alarm with hysteresis. Set-up by keyboard of the input type, thermocouples J, K, S, B and Pt100 thermoprobe. Configurable for direct, inverse or simultaneous action. Adjustment of the measurement offset. Power supply 230 Vac +/- 10%. Consumption 8 VA.
Potential-free relay outputs with cut-off capacity 5A/230Vac in a resistive load. Format 96x96. Panel cut-out 92x44 + 0.8 mm. Depth 140 mm including the connection terminals. Operation between 0 and 60ºC and between 0 and 80% of RH. Storage conditions between 10 and 60 ºC.